Guiseppe Ascione was a talented designer. His brother Michele was a skilled engineer. When they combined their talents with their passion for watches, a brand was born. It was no accident that their Gio Monaco timepieces were named for Guido Monaco, the inventor of musical notes and patron saint of their hometown of Arezzo, Italy. To the Ascione brothers, there has always been a connection between the harmony of music and the measurement of time. The spectacular Gio Monaco Graffiti Automatic is a superb example of this unique fusion of fine art and Swiss technology. This amazing timepiece is unlike anything you have ever seen before. The entire dial is a work of art. Depicting colorfully iconic geographic scenes from around the world, this unique dial puts time in a whole new perspective. A black PVD coated stainless steel bezel with distinctive inset markers frames the one-of-a-kind pop art dial. With a massive 44mm stainless steel case, a screw down protected crown and a bright blue genuine alligator leather strap, this artistic marvel is unmistakable. 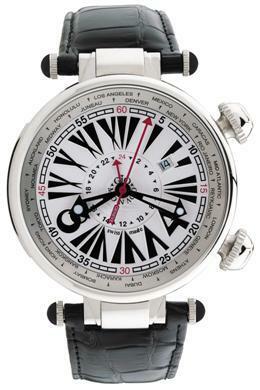 The Graffiti Automatic features a premium Swiss made ETA 7753 movement and is water resistant to 165 feet. The watch features a three-hand display with skeletonized hour and minute hands and is equipped with a scratch resistant antireflective sapphire crystal. If you share Guiseppe and Michele’s passion for art and engineering, you won’t want to miss this opportunity to wear a precision work of art on your own wrist. 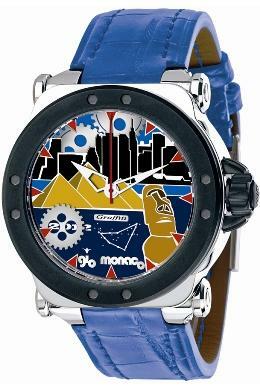 To reserve your Gio Monaco Graffiti Automatic, contact your nearest authorized Gio Monaco dealer today. When Giuseppe and Michele Ascione decided to turn their passion for watches into a company that manufactured fine timepieces, they made a commitment to never sacrifice art for expediency. 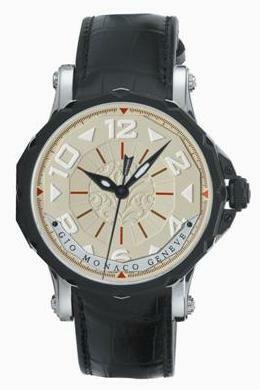 Their Gio Monaco brand has always been a fusion of fine art and precision technology. Each Gio Monaco timepiece makes a strong statement about elegance, balance and mechanical perfection that is exemplified in the spectacular Gio Monaco Geopolis Automatic Dual Time model. Featuring an oversize round white dial with stylized black Roman numerals, this uniquely original 47mm timepiece incorporates an easy-to-read dual time display, a graphic red second hand, a chapter ring with minute markers, and a rotating bezel with 24 cities representing each of the world’s time zones. This artistic wonder is the perfect way for cosmopolitan travelers to share their sophisticated sense of style with the rest of the world. This dual time masterpiece is powered by a high quality Swiss made ETA 2893 automatic movement and is water resistant to 660 feet. The watch has a convenient date window at 2 o’clock and is equipped with a scratch resistant anti-reflective sapphire crystal. The precisely constructed stainless steel case is fitted with a handsome black genuine alligator leather strap. Gio Monaco is a modern company with deep roots. The company’s name was inspired by Guido Monaco, the inventor of musical notes. The company’s exquisitely designed products could inspire you to make some sweet music of your own. If you’d like a watch that measures time with it’s own unique harmony, melody and sense of rhythm, contact your authorized Gio Monaco dealer today and reserve your own Geopolis Automatic Dual Time watch.